Back when we took our first cruise (has it really been over fifteen years?) the standing joke was that cruises were for the “over fed and nearly dead.” That was already an outdated stereotype way back then, but the cruise lines were still working hard to dispel that image. Years of adding rock climbing walls, zip lines, family programs and high-tech amenities have worked wonders: cruising is now seen as appealing to everyone of all ages from kids to grandparents. Then came river cruising. Even as the “new kid,” river cruising seems to be saddled with a similar stereotype – especially when it comes to the age of the passengers. In all honesty, the river cruise product initially seemed to be designed for an older clientele – mostly for two reasons: itinerary length and price. In the early days, river cruises focused on longer itineraries including pre and post land stays. While these are fantastic vacation opportunities, a lot of people who are not yet retired can’t take off that much time in one stretch. Now, the river cruise itineraries feature several seven day options and even a few four or five day river cruises. And all of those pre and post stays have become optional. Get the time change to work in your favor, and make the most of your vacation time! At first glance river cruising may look more expensive than ocean cruising, but we found that a lot of the things we end up spending money on when we go on the big-ship ocean cruises are already included in the river cruise price. Almost every port includes a shore excursion and sometimes you’ll get two ports in one day. 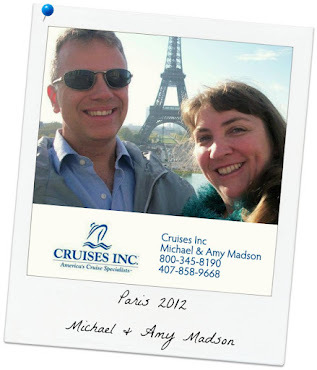 A lot of big-ship excursions cost $50-$100 per person or more, so this can add up fast! Included unlimited internet access! Okay, sometimes it’s limited by the terrain (poor signal in the locks) but we’ve been known to spend a lot of money for shipboard internet. Cappuccino, espresso and other specialty coffees are always included and always available. Bottled water is included and new bottles show up in your room every day. Included champagne and mimosas are available with breakfast every morning. Free-flowing wines and beer are included with dinner every night. The wines are from the region you’re cruising through that day and are chosen to compliment the menu. When they offer us “red or white,” we usually want to try both. The servers happily get more wine glasses and will keep pouring as much as you want. This can add up to an incredible value pretty quickly! Don’t get us wrong, river cruising is not to be confused with a “party boat,” but when your ever-attentive server just keeps filling up the glass (or glasses!) we enjoy a lot more wine than when we’ve purchased our own bottle. Plus the people we meet on river cruises have great stories and many are well-traveled making the dining experience even more enjoyable. There are also now a number of appealing activities on the river ships that we rarely see the “older folks” taking advantage of, but are nice additions to the onboard options. Almost all river ships include a small gym (treadmill, stationery bike, free weights, often a small sauna) and many of them have a hot tub or small swimming pool. Some of the ships will provide bicycles for you to use in the ports if you so desire. The entertainers on the ships are happy to adapt the music in the evening and play well into the night; we’ve heard everything from classical to crooners and hits from the 50’s to the 80’s to brand new music being played. And if you’re looking for even more nightlife, the crew can direct you to the clubs they go to when the ship has an overnight or late departure in any given port. While major river cruise providers like Viking River and AMAWaterways are working hard to offer amenities that appeal to a larger age range, we feel one line is noticeably reaching out to the “younger (ages 30 – 55) market,” and that is Avalon Waterways. From their inspiring viral video advertising, their internet social media presence, and their use of the newest trends including QR codes in their ads (that’s the little square with all the dots in it that people use with their smartphone to access information), Avalon seems to “get it”. So it’s time to prove the stereotypes wrong. We’d like to invite cruisers, travelers, and vacationers of all ages to experience river cruising! It’s a fantastic way to immerse yourselves in the destinations you visit. And you can visit 7 European cities in 3 countries all within 5 days on board a river cruise. Who’s ready for a taste of river cruising? Are you ready for a Taste of River Cruising?